In 1970, Motor Trend magazine selected the Ford Torino as its “Car of the Year”. For 1971, Ford didn’t waste a lot of time or money changing the car. There were minor changes to the grille and that was mostly it. 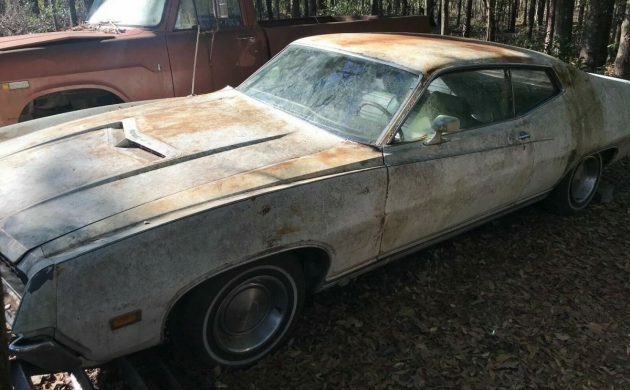 Here is a 1971 Ford Torino GT SportsRoof for sale here on eBay in Grovetown, Georgia. The GT featured hood scoop, dual color-keyed racing mirrors, tinted back glass, and ribbed rocker molding featuring the GT logo between the front wheel opening and door. The paint job on this Torino GT is showing quite a bit of patina, with some surface rust and thinned paint in some areas. The front grille frame is broken in the center, and the GT insignia, while included, is off. This one owner car is sporting the standard hubcaps with trim rings. This model emphasizes with pinstriping the side dip from the front fender top through the door dropping between the door handle and door lock. It further drops down below the side back glass. The GT features a rear simulating full-width taillights. 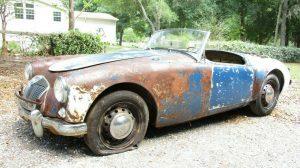 The seller says it will need a new hood and deck lid due to rust on the edges. The doors open and close fine. 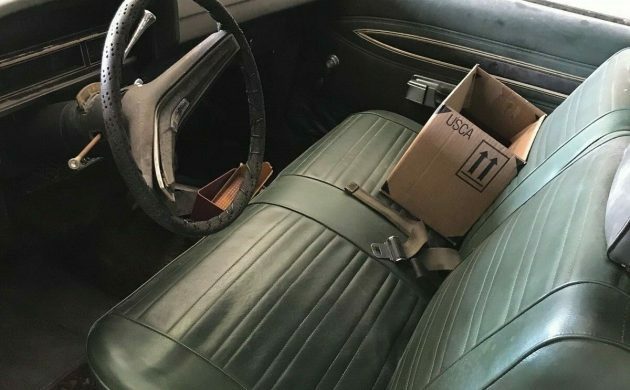 The interior is in good condition. It features a full-width front bench seat and back seat with no cracks or tears. The dash has no cracks either, but the steering wheel does have the center section pulling away. The car has SelectShift Cruise-O-Matic automatic transmission. The seller has the original title and sale invoice that go with the car. The engine is the original 351 cubic inch Cleveland V-8 with 2 barrel carburetor, but it is not running. The seller states that the oil, air filter, and coolant are clean. While the car has not run since 1998, it clocked 129,000 miles up to that time. 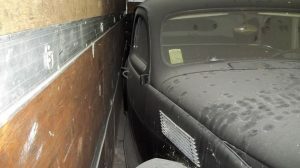 The seller says he/she has no interest in the car because they are not a Ford fan, but says they will not give it away. Are you looking for a sporty Ford project car? This could be the one for you. This car has been around for a while. 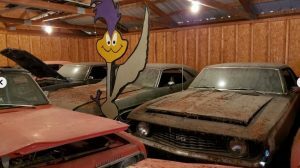 1 owner- owned 48 years – but they don’t like Fords? Hmmmm… Inherited maybe? First thing that went through my mind. And even if you weren’t a Ford fan now, wouldn’t you feel attached to a nice car that you bought brand new and still have? Don’t understand some people. Hmmm….classic car dealer (based on the ebay user name), but they don’t like Fords. Good salesmanship! They advise you to “read carefully”, and given that they seem to write at a 3rd grade level, that makes perfect sense. Pass. Looks like a solid project car. Darn fine automobile…at one time or another. Must have been a nice looking car to drive back and forth to work everyday or whatever driving chores it was used for. The two barrel 351 Cleveland would make a decent high performance street engine, if one wanted to go that route. 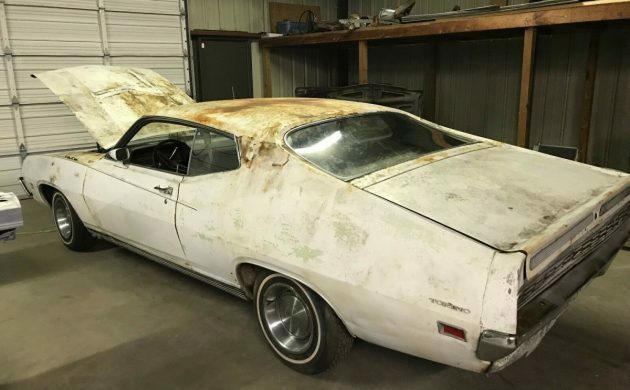 A 1971 one owner car that the seller has no interest in because he is not a Ford fan…………………….apparently a creative new definition of “one owner”? Ahhhh….looks like the one owner parked it after it stopped running. Hence why it does not run now. You can call it a one owner, as whomever buys it will be number two. Don’t know if the ebay lister has changed title into his name. He’s not a Ford fan, otherwise he would keep it for himself. That could have been worded better, and even I am paraphrasing his comments. I owned exact same car with 4 barrel and factory duals. Cream color and that green interior wasn’t very pretty but it was fast as heck. 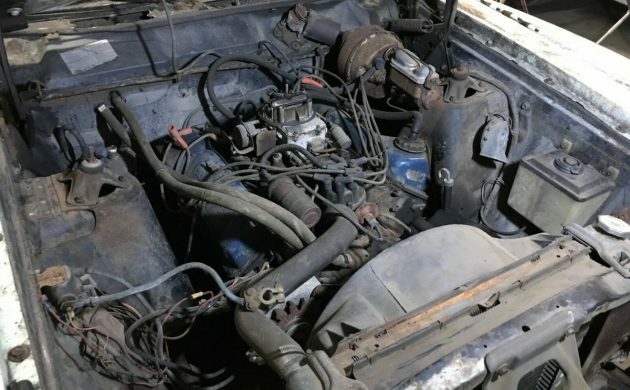 In 1971, a Boss 351 was available with better heads, bigger valves, and a 4-bolt main block and a nodular iron crankshaft, with upgraded connecting rods. If you really wanted to get serious about getting performance, pull out the 351, and put a Roush Engineering 427 in it’s place! My first brand new car was a 1970 Torino GT fastback, 351-4V, auto, PS, power Disc brakes, laser stripe, hide-a-way headlights, trailer towing package, optional axle ratio, posi-traction, radio & rear seat speakers, rear window defoger, light group & A/C. $3300 out the door! Sure wished I still had that car! Saved my dad’s 71 convert for him when he was going down….they are nice but l let his wife’s kids have it. 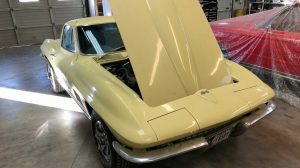 Good looking cars…..
I’ve mentioned here on BF about my brothers original ‘70 Cobra 429 in this same paint color and blacked out hood with “shaker” ram-air,and loaded with every option available. 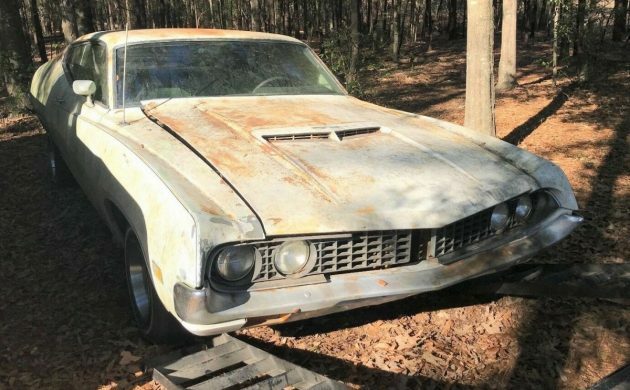 This ‘71 GT would be awesome to add to the family, and looks like a solid start for a rare project! 4 hours to go and still only 1 bidder at $4,500. It’s worth that for a project but not much more. I agree that this car has been on a site somewhere before. I remember the car. It says one owner, it doesn’t say the person who owns it now never changed the bill of sale, he could be the second or third owner. I dont think anyone that does not like Fords would purchase a new one. Snap you could of bought a Chevy or mopar for less money. I smell something nasty and brown here.